For the lock-on minigame, see Blue Sphere. Sonic & Knuckles is a platform game in the Sonic the Hedgehog series, developed by Sonic Team in collaboration with Sega Technical Institute, and published by Sega for the Sega Genesis in 1994. It is the direct sequel to Sonic the Hedgehog 3, which was released earlier that year. The game features unique "lock-on technology" which enables another cartridge to be plugged in via the socket on top. This allows for Knuckles to be used in Sonic the Hedgehog 2 and links the two direct sequels together into Sonic the Hedgehog 3 & Knuckles. 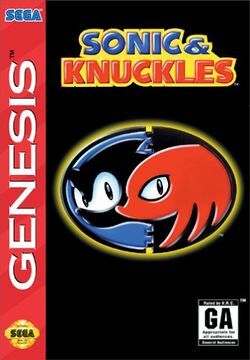 It was released on Windows via Steam as Sonic 3 & Knuckles, though the title screen says Sonic 3 Sonic The Hedgehog & Knuckles. The game was included in the Sonic's Ultimate Genesis Collection compilation in 2009 for the PS3 and Xbox 360. This page was last edited on 4 July 2016, at 14:02. This page has been accessed 23,947 times.